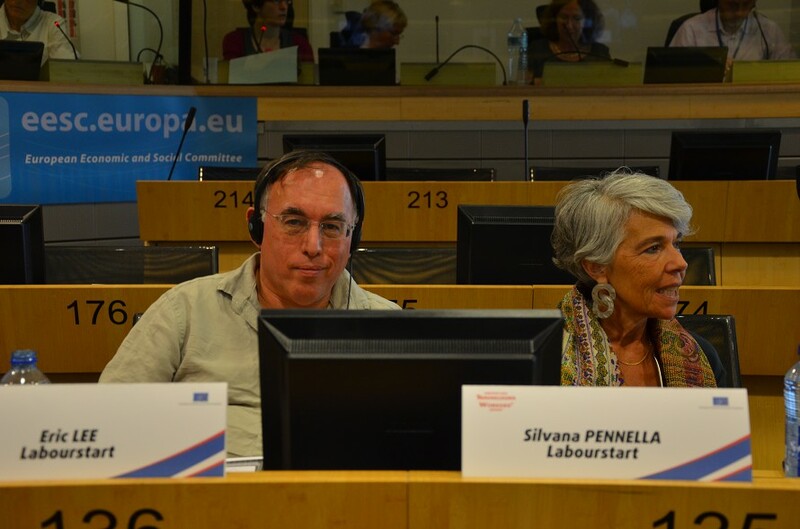 Yesterday, thanks to the initiative of Silvana, I was invited to address the regular meeting of the Workers Group of the European Economic and Social Committee, a gathering of nearly 100 trade union leaders from all over Europe. LabourStart was given 30 minutes on the agenda and we followed their adoption of a statement on Greece. I spoke and showed a PowerPoint presentation (see it here as a PDF), and we distributed LabourStart flyers to all delegates. There was a lively discussion, and some were quite familiar with our work and praised it. Others were introduced to LabourStart for the first time and are keen to work with us, including the Lithuanian delegation. Following the online campaigning course last week in Hattingen, Germany, we’ve heard from two participants — one from Malta who has begun translating our campaigns into Maltese, and one from the European Federation of Journalists who will be working with us on our next campaign. Our Malaysia campaign continues to grow and is up to 6,459 supporters as of mid-day today. Thanks to our ongoing ad campaign, we’re nearly up to 10,000 fans on Facebook — we have picked up 247 new fans in the last 8 days, and have just 110 to go. We’ll be able to revive the Labour Video of the Year competition thanks to our ongoing partnership with the London Labour Film Festival, which takes place this year in September. More details soon. The ILO office in Burma has asked permission to translate our book on the Global Labour Movement into Burmese and publish it there. We’ve agreed. Finally, I visited this week with a London-based web design company which organized the recent Hack Day at Mozilla which had a trade union theme and at which we made a presentation. They’re keep to help with with technological issues and have some very interesting ideas (and a wealth of experience). We’re considering sharing office space with them, so this could be the beginning of a kind of partnership which could help us enormously. Following the discussion we held at the annual correspondents’ meeting in Istanbul, we will not be hold a Labour Photo of the Year competition this year. However, we will continue with the Labour Video of the Year competition and I will begin work on this on 9 January, when I’m back from winter travels. We will also be exploring the possibility – suggested by Kristyne Peter of the IMF – of ‘campaign of the year’. The winning video in this year’s Labour Video of the Year competition is this one. There were 1,168 votes cast – much lower than we had last year. Of those, 280 agreed to be on LabourStart’s mailing list and had not been on our list before. Labour Video of the Year: Where are the voters? With little more than a week left to vote, we’ve had 953 votes cost. Last year, 3,000 people voted. Obviously, we’ll send out reminders. But any thoughts on why so few people are voting this time? Labour Video of the Year: 540 votes have been cast in the last 48 hours, averaging 270 votes cast per day. Last year, we got about 3,000 votes cast. So this year with another 26 days to go, we basically need 100 votes a day to reach the same number of people. You can watch the results in real time here. May Day appeal: I’ve now written to all correspondents asking for their help to get their unions to donate. So far, the appeal has raised just under £2,000 (US$3,308). This is slightly more than we raised last year by this point. Global Solidarity Conference: In another week from today, I’m off to Istanbul for a second meeting with the organizing committee. I’ll have a full report when I’m back. Our campaigns: I continue to update this page – we’re now covered through July 2006, nearly five years. In that time, we ran 124 campaigns (an average of around 25 campaigns each year). Of those, 16 were very large campaigns (by our standards), with more than 5,000 messages sent out in English alone. Of those campaigns, there were one each from Australia, New Zealand, Canada, the UK, Korea, Mexico and Zimbabwe. Two were Turkish campaigns. And nearly half of them – 7 campaigns – were focussed on workers in Iran. Click here to vote – the deadline is 31 May 2011. Last year, we had about 3,000 votes cast – let’s see if we can beat that this year. We’ll use Survey Monkey as we have done in the past – it should block multiple voting and will make it very easy to tabulate results, etc. For the non-English films, I suggest we set up parallel voting so that individuals (presumably those who speak the language) can vote for their favorite Spanish film, for example. In other words, a parallel competition but without the panel of judges creating a shortlist. That should work for now. I’m assuming that we won’t have the shortlist before May, so expect voting to take place then. Our Facebook page went from 0 to 117 likes in the first 24 hours online. Yesterday’s mass mailing focussed on the IUF’s victory in Indonesia against Nestle – driving a substantial amount of traffic to the IUF website as a result. The number of submissions to the Labour Video of the Year has stalled. Only 2 new submissions came in as a result of the mass mailing. We’ve now done five mailings using MailChimp – 2 to our correspondents and 3 to our English language list. I’ve only gotten one bit of feedback – someone who noticed and liked the improvement. No complaints from anyone. I’m in discussions with Mahesh about getting the Hindi and Bengali editions of LabourStart off the ground – hopefully soon. I’ve been working on my presentation for the debate on Monday at Oxford on activism vs slacktivism, as well as Thursday’s talk in New Orleans at the UALE conference. We’ve had a slow flow of nominations for the Labour Video of the Year competition – only 16 nominated so far. I’ve sent out a reminder to our lists. We’re also just beginning to collect pre-registrations for our global solidarity conference in Istanbul using Facebook. At the moment we have 10 saying yes and 12 saying maybe, for a total of 22. I expect this to increase in the next few days as we’ve not only mentioned it in our mailings, but have just sent it out to members of all our causes on Facebook.